Also a stylish accessory for your stainless steel rumbler tumbler, what's more, it keeps your drinks cold for a longer time; 9.5" length is a perfect fit for your 30oz travel rumbler tumbler,tall glasses of juice or cocktails or to use in your insulated thermos or cooler mug. 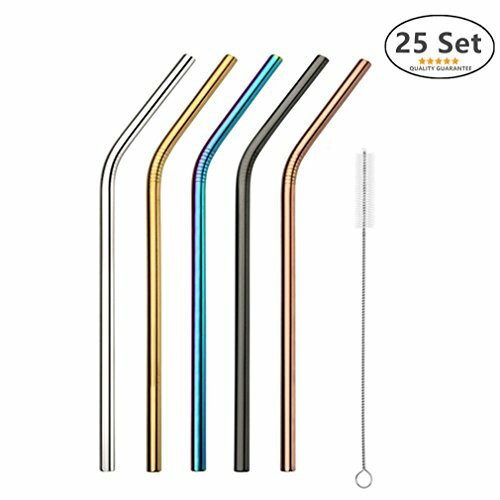 Get a Set of 25 Bent Stainless Steel Straws, trendy for family reunion,girl's night out,cocktail party,perfect for on-the-go, kitchen, BBQ, picnics, party favors, boating as well all around the house, or out on the patio! Dishwasher safe, scratch-free and stain-free;comes with 5 flexible cleaning brushes, making cleaning as easy as it can get. SAVE THE ENVIRONMENT and Get Pleasure- To eliminate unnecessary waste by switching to materials that are kinder to the environment and can be reused, rather than disposed of after one use. add fun to any party, trendy for family reunion,girl's night out,cocktail party,Patio BBQ,picnics,boating and more! THE PERFECT FIT- With diameter of 8mm, those straws has more diameter fit for drinking smoothies and thick drink ,cold bevarage,coffee,ice tea,etc. FITS YOUR INSULATED TUMBLER - Set of 25 Bent Stainless Straws + 5 cleaning brushes ( Color :Silver, Golden ,Black ,Copper, Iridescence ),total length of 9.5 inch, Fits perfectly with 20 oz. and 30 oz. tumblers. HIGH QUALITY -Made of food-grade 18/8 stainless steel,no metal aftertaste,plastic free, BPA free, dishwasher safe,reusable and environmentally friendly. Perfect to use indoors and outdoors. If you have any questions about this product by MIUVA, contact us by completing and submitting the form below. If you are looking for a specif part number, please include it with your message.